To meet a projected population of 9.8 billion by 2050, global food production needs to grow an estimated 70 percent. Rising patterns of extreme weather are challenging food security. To adapt and feed the world, we need stronger crops. Glaciers are melting, sea levels are rising, wildfires are blazing and droughts are intensifying. Our earth is in an alarming state of flux. For food producers, these climatic shifts could prove devastating. California is the nation’s leader in agricultural production and exports, with food producers generating $45 billion in output in 2016. According to the Department of Food and Agriculture, the Golden State provides one-third of the country’s vegetables and two-thirds of its fruits and nuts. 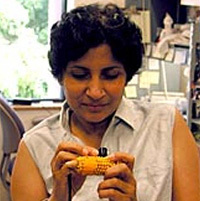 “Over a few thousand years human beings have selected varieties with traits that have allowed agriculture to flourish and human civilizations to grow and evolve,” says Neelima Sinha, professor of plant biology. Through domestication and selective propagation, agricultural producers have bred crops for efficiency, selecting lines that produce higher yields and better tastes. This interference by human hands has weakened some crops, causing some to lose adaptive traits that once helped them flourish in environments rife with stressors, like droughts and parasites. California’s intensified natural disasters and droughts undoubtedly spell trouble for the state’s crops. UC Davis plant biologists are looking to wild relatives for hints to strengthen crops, with the hope that the key to resilience lies in their genetics. The arid Andean Region of South America is home to one tough wild tomato species. Drought-, salt- and pathogen-tolerant, Solanum pennellii is an ideal study in extreme plant adaptations. Strong roots and waxy-skinned fruits and leaves help S. pennellii cope with desert challenges. UC Davis researchers are immersed in understanding S. pennellii’s durability. Brady studies S. pennellii and its domesticated relative Solanum lycopersium, the garden tomato. Unlike garden varieties, the desert tomato’s roots continuously accumulate the compound suberin in its outer root layer, which enables water retention. The compound is only expressed in garden tomatoes during times of intense drought. With cutting-edge genomics tools, Brady and her team seek the key to suberin production in the desert tomato. This data could help identify the mechanisms to introduce resilient root traits in other crops. “If it can be expanded to other crops by breeding for a particular factor that might increase its presence, then it could provide the garden tomato’s roots with more waterproofing and a better ability to withstand drought,” Brady says. Illustration inspired by the field notebook of the late UC Davis researcher Sharon Gray. A shifting climate isn’t the only threat to producing bountiful harvests. More than 4,000 different species of parasitic plants leech nutrients from host plants, leaving destruction in their wake. The parasitic plant genus Striga has been known to cause up to 90 percent loss in crop yields. According to the International Maize and Wheat Improvement Center, the weed affects more than 49 million acres of cropland in sub-Saharan Africa. It attaches to cereals like maize and sorghum, costing an estimated $1 billion in losses annually. Witchweed actively hunts its prey. When sorghum roots are low in phosphorous, they secrete a molecule called strigolactone, which tells the roots to uptake more of the nutrient. But strigolactone acts like a smoke signal for witchweed. Since witchweed evolved in tandem with sorghum, some sorghum crops have developed resistance to the parasite. Around 70 percent show some degree of tolerance or resistance. Brady and her colleagues investigate the genetic mechanisms of resistant sorghum strains. 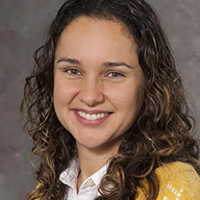 She recently started a project to genetically define how sorghum roots interact with the soil microbiome to either facilitate or suppress witchweed growth. Meanwhile, Sinha studies Cuscuta, also known as dodder. Common in California, the parasitic plant grows like cobwebs of orange spaghetti as it envelops its host. Sinha studies the genetic interactions between dodder and host plants. Like Brady, Sinha is trying to understand at the genetic level what makes certain crops resistant or susceptible to dodder. 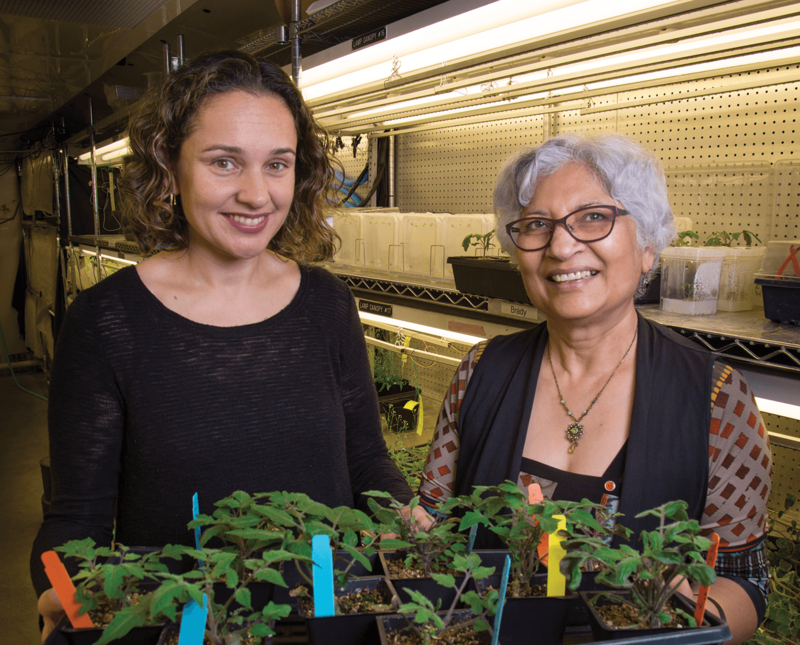 By investigating plant genomes, Brady and Sinha hope to find the genetic triggers that enable plant defenses. 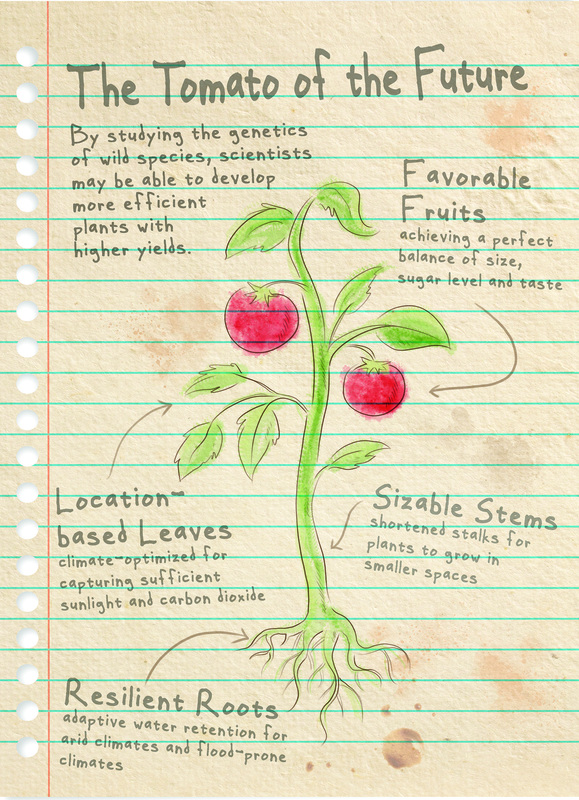 With this knowledge, researchers could introduce these traits into our crops, ensuring their survival in a shifting climate. Plants produce an array of chemical compounds to cope with environmental challenges. From defending against predators to attracting pollinators, these chemicals, called metabolites, number in the hundreds of thousands and vary from species to species. Each plant is unique in its chemical repertoire, making them the envy of organic chemists. 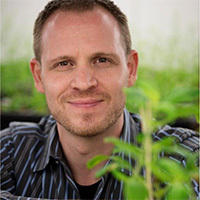 Zerbe works to decode the diversity of plants by mapping the genes, enzymes and pathways that form their complex metabolic machinery. 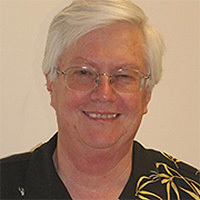 He’s particularly interested in terpenoids, the largest and most diverse class of metabolites. Terpenoids perform many functions, from regulating growth and development to protecting plants from environmental stresses like drought and salinity. To Zerbe and other biologists, the advent of targeted genome editing with technologies like CRISPR/Cas9 has been a game-changer. It’s now possible for plant biologists to pinpoint the genes and pathways involved in specific metabolite production, which could then be introduced into crop varieties. As the earth’s climate shifts, humanity must be proactive. To maintain food security, we must develop more resilient crops. Studying the strategies of wild and parasitic plants could prove essential in preparing our crops for a changing future. At UC Davis, plant biologists are making the foundational, multidisciplinary discoveries that will help adapt food production to thrive in a new world. During the Great Depression, President Franklin D. Roosevelt addressed Congress about the worrisome decline of soil quality in the United States. 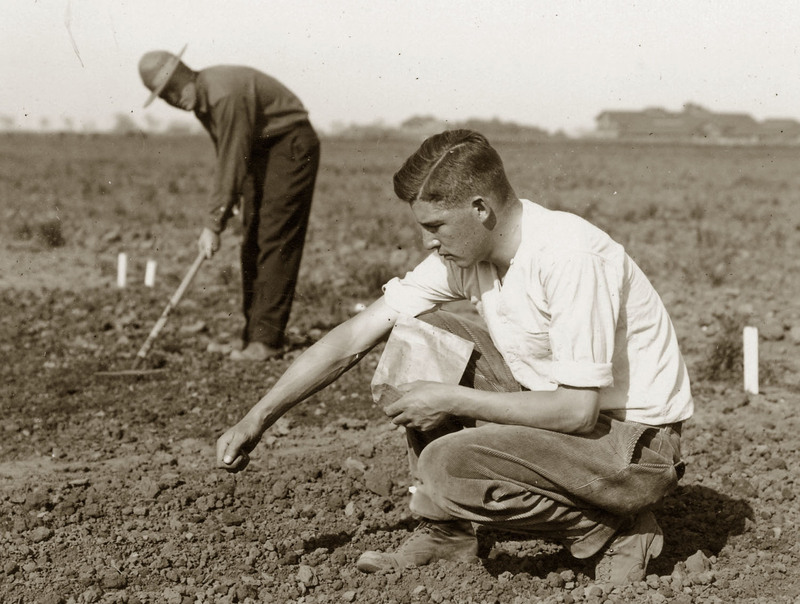 Many soil types were deficient in phosphorous, causing low yields and poor crop quality, Roosevelt explained. Heeding these warnings, farmers applied high levels of phosphate-rich fertilizer on farmland. Food production soared, and by the end of the 20th century, use of such fertilizers had roughly quadrupled. Today, non-renewable phosphate resources across the globe are rapidly depleting. As traditional plant breeding efforts are performed in the presence of high levels of applied phosphate fertilizer, crop lines have emerged that use phosphorus inefficiently. To mitigate forthcoming phosphate shortages, researchers need to identify and restore the genes and regulatory networks that were lost through domestication. In Philipp Zerbe’s lab, student researchers Katie Murphy and Prema Karunanithi use CRISPR/Cas9 gene editing technology to uncover the molecular mechanisms of plant function. Murphy, a plant biology Ph.D. student, likens CRISPR technology to automotive maintenance. It lifts the hood, allowing researchers to explore the plant’s mechanics by “cutting” certain genes so they no longer work. Plants synthesize hundreds of thousands of different chemical compounds. To identify which genes help produce certain chemical compounds, the students sometimes place the genes in a model organism, such as the bacteria E. coli, and figure out what chemicals are produced. This gives them a clearer blueprint of the compound’s synthesis. “All domains of life produce these compounds, it’s just that plants have a better diversity of these compounds,” says Karunanithi, a biochemistry, molecular, cellular and developmental biology Ph.D. student. 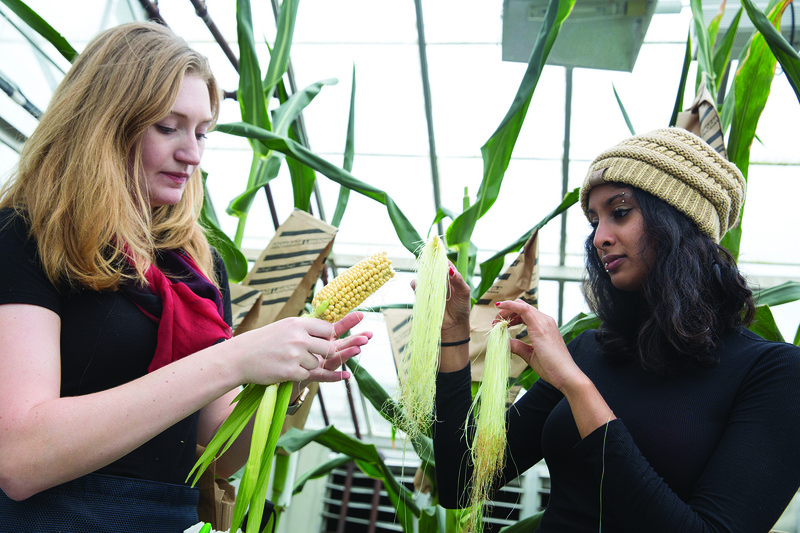 While the students aren’t placing new genes in crop plants themselves, one thing they ponder is how their research will inform the design of crops better suited to a changing climate.